Can corn stover harvested for biofuel energy be sustainable? This article examines production, potential yields and challenges of harvesting corn stover while maintaining soil quality. Corn stover bales. Photo: F. John Hay, Extension Educator, University of Nebraska-Lincoln Extension. Corn stover is one of the largest potential annual crop-based biofuel feedstocks for several key reasons: the quantity of feedstock in the United States is large, the feedstock is relatively uniform, the cost of production is relatively low, and large quantities are concentrated in some regions. But harvesting corn stover can have long-term impacts on soil quality, soil carbon, and soil erosion unless it is done with a sustainable approach. The current supply of corn stover has been estimated at 75 million tons per year with much more supply in the future. Corn yields have been increasing steadily in the United States for the past 30 years, and stover yields have been increasing as well. During the period of 1979-2009, U.S. grain yields have increased by 49% from 109.5 to 162.9 bushels/acre, and presumably stover yields have increased similarly as well. Future yield increases could contribute to higher stover yields and more potential for corn stover as a biofuel feedstock. Some stover removal may actually become necessary in northern cool soil locations if yields and adoption of minimum tillage both increase. Stover bale. Photo: Greg Roth, Professor of Agronomy, Penn State. Collection efficiency of the stover can vary dramatically depending on the machine and time of year the material is collected. In the common system of mowing, raking, and baling, collection efficiencies of about 70% have been reported. Other experimental systems that collect the stover during grain harvest can collect nearly 100% of the material. Novel harvesting methods of harvesting the stover with the combine are being evaluated to speed the harvest and allow the producer to selectively harvest only part of the corn stover during the grain harvest process. One prototype machine is in use at Iowa State University. Stover yields are generally closely related to grain yields. Since the harvest index of corn (the ratio of grain to total plant biomass is usually near 0.50, the ratio of grain to stover in corn is close to 1:1. Thus, a crop that yields 150 bu/acre or 7,100 pounds of dry matter (150 bushels x 56 lb/bushel x 0.845 lb dry matter/pound) will likely yield a similar amount of stover. Corn stover also contains significant fertilizer nutrients, which would need to be replaced with commercial fertilizer or other nutrient sources, at some cost to the producer. With a corn stover harvest, the nutrient removal per ton of feedstock has been estimated to be about 5.9 lb P2O5 and 25.0 lb of K2O. At an example price of $0.38 per lb P2O5 and $0.24 per lb K2O, the cost per ton of removal would be $2.24 for P2O5 and $6.00/ton for K2O. Iowa State University has summarized nutrient removal of corn stover. Removal of other nutrients such as N, S, Mg, and Ca and micronutrients should also be considered in the long term. A University of Minnesota report indicated that corn stover was one of the least expensive biomass resources to harvest and transport and estimated the cost of production and transportation to be $50/ton. The composition of corn stover can also vary depending on the harvest method, the fraction collected, and the time of year. The upper part of the corn plant is generally less lignified and more digestible than the lower portion of the plant. As such, it is a more desirable fraction for cellulosic ethanol. Leaving stover in the field for most of the winter can cause some of the plant nutrients to be leached out and reduces the fertilizer nutrient removal. Corn stover harvest. Photo: Dennis Pennington, Bioenergy Educator, Michigan State University. One issue with corn stover is the timing of harvest and the method of storage. 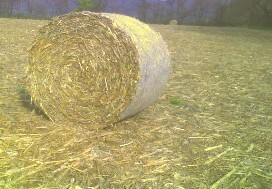 Stover can be harvested as a dry material (20% moisture) and baled or as a wet material (40% moisture) and ensiled either in bags or in wrapped bales. Recent research in Wisconsin has evaluated some of the issues associated with the wet or dry harvesting systems. In that study, researchers found that field drying of stover in the field was slow due to low temperatures and frequent precipitation. Also, the harvest rates of shredder stover was fastest with a forage harvester, then a large square baler, and then a round baler. Some other practical recommendations for harvesting corn stover have been summarized in an Ohio State University fact sheet. This fact sheet discusses the potential of ensiling or baling stover, depending on the moisture content and the need to establish a cover crop following harvest if possible. 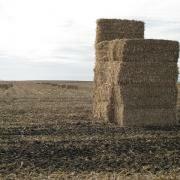 Harvesting methods developed for use of stover as an animal bedding or feed may have some drawbacks for use of the stover as a biofuel feedstock. 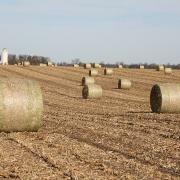 These drawbacks could include contamination of the bales with dirt and plastic, a low labor efficiency of the process, bale breakage, and consistency of the product. Development of new economic models for stover harvest are needed that include the potential for less tillage, carbon and renewable energy credits, and rapid harvesting systems with minimal soil contamination. Removing stover can lead to more severe water and wind erosion in some cases. Removing corn stover can also lead to lower soil organic matter or carbon levels. Models are being developed that help estimate the amount of stover necessary to remain on the field to maintain soil quality. One study has suggested that maintaining soil carbon levels is often a greater limitation for stover harvesting than the stover needed to minimize water and wind erosion. The amount of stover needed to be retained to maintain soil carbon levels varies depending on several factors, but one national target that has been suggested is approximately 2.3 tons per acre in a no-till continuous corn system and 3.5 tons/acre in a corn soybean system. This level would likely limit stover harvesting for commercial biofuel to some of the highest corn-producing areas in the United States. Removing corn stover could have some advantages. Large amounts of stover can interfere with no-till planting, causing corn growers to perform one or more tillage operations to bury part of the residue. It also keeps the soil cool and wet in the spring and can harbor insect and disease organisms, resulting in a need for more pesticides. However, removing corn stover also has several potential disadvantages such as potential impacts on soil organic matter, increased potential for soil erosion, and nutrient removal that need to be addressed before it can be utilized on a widespread basis. It may be possible to increase the sustainable removal rate if other management practices are implemented. These might include the establishment of cover crops, no-tillage, narrower row spacing, higher plant populations, higher fertilization rates, or application of bio-char or other organic amendments. Corn stover is a potential biofuel feedstock, but management strategies must be developed that minimize the potential impacts on soil quality and sustainability while contributing to the goals set by DOE in 2005. ↑ “The Billion Ton Study”, Biomass as Feedstock for Bioenergy and Bioproducts Industry: The Technical Feasibility of a Billion-Ton Annual Supply. U.S. Department of Energy and Department of Agriculture, 2005. ↑ “Nutrient removal when harvesting corn stover”, Iowa State University, Integrated Crop Management Newsletter, August 6, 2007.